The Lial Series has helped thousands of students succeed in developmental mathematics by combining clear, concise writing and examples with carefully crafted exercises to support skill development and conceptual understanding. The reader-friendly style delivers help precisely when needed. This revision continues to support students with enhancements in the text and MyLab™ Math course to encourage conceptual understanding beyond skills and procedures. Student-oriented features throughout the text and MyLab Math, including the Relating Concepts exercises, Guided Solutions, Test Your Word Power, and the Lial Video Library, make the Lial series one of the most well-rounded and student-friendly available. NOTE: You are purchasing a standalone product; MyLab Math does not come packaged with this content. 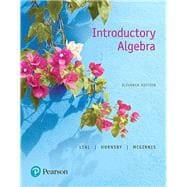 Students, if interested in purchasing this title with MyLab Math, ask your instructor for the correct package ISBN and Course ID. Instructors, contact your Pearson representative for more information.